August is typically the hottest month of the summer in Bend. Luckily, there are a plethora of unique places to swim in the area to help you cool off. We’ve compiled an eclectic collection of swimming options for you to choose from–hot, cold, indoors, outdoors, natural, and manmade–and their distances from PointsWest. Whatever floats your innertube, we’re sure you’ll find a swimming hole to (swim)suit your fancy. PointsWest is located right next to Seventh Mountain Resort, which means you get to enjoy everything they have to offer right in your backyard. This includes whitewater rafting, paddle boarding tours, 2 outdoor heated pools and 3 outdoor hot tubs. 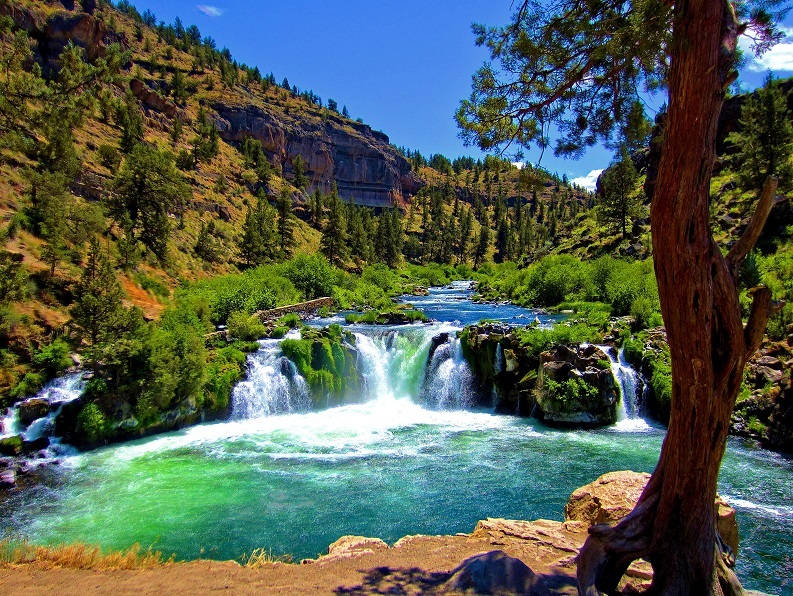 Stay close to home by meandering down to the Deschutes River at a local park. Even if you don’t bring a floatie, raft, kayak, paddleboard, canoe, or blow-up killer whale, you’ll be all set. The soaking pool at St. Francis is semi-enclosed, so you can relax even as the Central Oregon snow or rain falls in through the open ceiling. It is surrounded by stained glass windows, turquoise tiles, and a beautiful mural depicting St. Francis harvesting grapes that was handcrafted, fired and painted by Justyn Livingston. The pool is filled with soft, buoyant water, which makes for a more environmentally friendly soak. Complete your afternoon of relaxation with a glass of wine or a craft beer after your soak. A beautiful, clear mountain lake nestled in the sunny Oregon Cascades just up the road on Century Drive from PointsWest. Water temperature varies from 68-72° F–perfect for taking a dip with a view of our beloved Mt. Bachelor. Aside from sunbathing and water play activities, SHARC’s 22-acres of fun includes a tot pool and sand play area, cafe, picnic area, playground, basketball court, bocce ball court, year-round tubing hill, picnic pavilion and an outdoor amphitheater. Whew! What more could you want? For the more adventurous swimmer, Steelhead Falls is a well-kept secret near Crooked River Ranch. A few miles west of Highway 97 (across from Smith Rock State Park) is a secluded area along the snow-fed Deschutes River perfect for swimming and cliff jumping with amazing views of the river valley. Many of the hot springs in both Paulina and East Lake occur under water, but there are spots where springs can be found (or constructed) along either. The ones at Paulina are typically easier to harness. Their main location is in the north east corner of the lake and along that area’s shoreline. Spring water that is isolated before reaching the lake can reach up to 126º F, so creating a pool that blends lake water and spring water is advisable. Basically, it’s a build-your-own natural hot spring. Neat! Kids and adults alike love the 140-foot-long slide and the newer 184-foot long slide into the waters of the double Olympic-sized hot springs mineral pool. The village hot springs pool is open year-round — cooled during the summer and heated to 92 degrees during the fall season. Bonus: you can get a room at the reservation and even rent a teepee for the night. Of course, Bend has a lot more great places to swim, but these are a good start. Besides, half the fun is finding your very own swimming hole in Central Oregon, away from all the summer crowds. Have at it! We are lucky to have so many natural and beautiful swimming holes nearby. However, they can be dangerous. When swimming at a lake, river, creek, or waterfall, observe your route FIRST, or go with others who have been before. Landing on rocks and getting caught in fast currents has a funny way of ruining your day. Always remember to bring sunscreen and supervise children. PointsWest. This is what buyers say!